Natasha Borzilova plays Music City Roots! Late in July of 2011 Natasha Borzilova made her first appearance on Music City Roots which is a weekly, two-hour radio show that revives the historic legacy of live musical radio production in Nashville. Broadcast on Wednesday nights from 7pm to 9pm, CST, Music City Roots, Live From The Loveless Cafe showcases Nashville’s astonishing music scene, from country and Americana to more progressive interpreters of tradition — a “roots and branches” format that brings together fans of different tastes and generations. Presented live from the stage of the Loveless Barn, this show showcases purveyors of authenticity across many genres. Below is a video clip of Natasha performing the title track to her first solo release “Cheap Escape”. 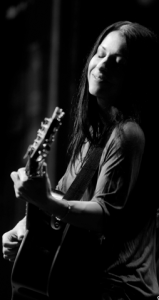 She wrote the song with label mate Donna Ulisse.